FreeCharge is come and amazing offer again, new Freecharge is offering 100% Cashback Offer On Reliance Prepaid Recharge. This offer is also posted on reliance officialy twitter, i also share twitter to let you know it’s will work.so grab promocode below and start get cashback. 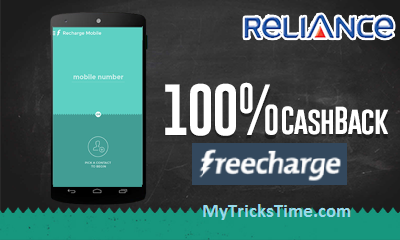 Reliance Prepaid CDMA Recharges On Freecharge. This Offer Valid For First Transaction On Freecharge. Enter your Reliance CDMA mobile no.